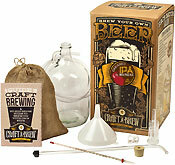 This American Pale Ale Craft A Brew kit is a great place to start for beginning and intermediate home brewers. Made from high quality fresh ingredients from the craft brewing industry this brewing kit includes everything you will need to brew your first gallon of top-quality beer. MAKES A GREAT GIFT! Orders received by 10am PST Monday through Friday will ship the same business day. Orders received after 10am PST Monday through Friday will ship the next business day. My son in law is hard to buy gifts for, he loved this brew kit and said he can't wait to try his own home brew! Thanks for the great service!